Six new communications relay satellites were launched into orbit Thursday to rejuvenate a space-based messaging service operated by ORBCOMM Inc. The six spacecraft were hauled into orbit by a Kosmos 3M rocket launched from the Kapustin Yar space base in southwestern Russia. Liftoff was at 0636 GMT (2:36 a.m. EDT). The two-stage booster was aiming for an orbit with an altitude of about 415 miles and an inclination of 48.5 degrees. ORBCOMM officials announced the launch was a success. The satellites will join ORBCOMM's current fleet of 29 spacecraft that provide machine-to-machine messaging for the company's industrial customers, which include General Electric, Caterpillar Corp., Volvo Group, and Komatsu Ltd.
"This is an important step for us and our customers," said Marc Eisenberg, ORBCOMM CEO. Controllers plan to put the satellites into service by the end of the summer, according to ORBCOMM. The New Jersey-based company serves customers in the commercial transportation, heavy equipment, industrial fixed assets, and marine security markets. Five of the craft launched Thursday are upgraded satellites designed to replenish the company's aging constellation. ORBCOMM satellites currently in orbit are at least eight years old, well beyond the original constellation's four-year design life. The five satellites are dubbed Quick Launch platforms, meaning they were prepared for launch when needed. They each weighed about 254 pounds at liftoff, said Steffen Leuthold, a spokesman for OHB-System of Germany, the prime contractor for the spacecraft. The other spacecraft will demonstrate a concept to track ships for the U.S. Coast Guard. 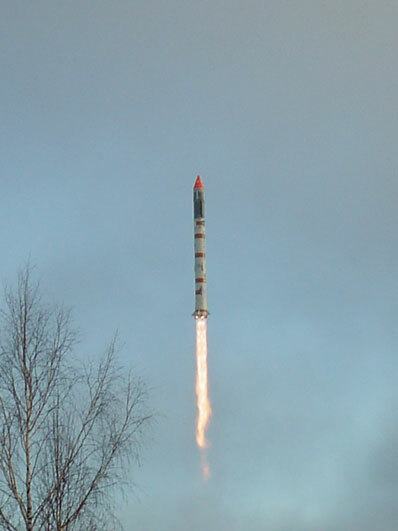 OHB-System led the construction and testing of the satellites. Orbital Sciences Corp. of Dulles, Va., developed the UHF and VHF communication payloads for the spacecraft. The new satellites carry extra receivers to increase their communications capacity and cut message delivery times. Officials expect the craft to operate for up to 10 years. The 176-pound Coast Guard demo satellite is outfitted with equipment for the Automatic Identification System, a global network to monitor maritime traffic. The craft will be the first commercial satellite to use the system to relay navigation signals from ships around the world. The system now relies mostly on ground antennas to receive signals from ocean vessels. "With the successful launch of these six new satellites, we expect to both improve the quality of our service and enter the AIS data services business," Eisenberg said. Officials said they plan to sell the ship tracking service to international coast guards and multinational companies. ORBCOMM inked a $117 million deal with MicroSat Systems last month for at least 18 next-generation satellites. The new platforms will accommodate 12 times more customers than the company's current fleet. The contract, which includes options for up to 30 additional satellites, calls for the second-generation satellites to launch in 2010 and 2011.